Ready to look like a rock star in your video response question? Here are some tips that will help you put your best foot forward. 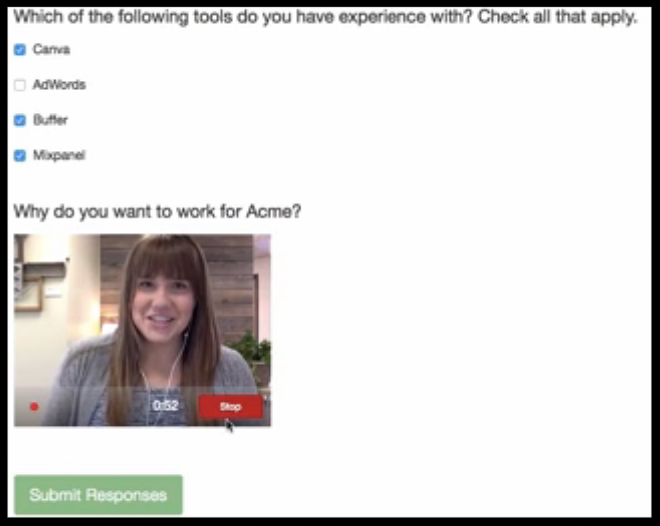 More and more companies are now using video applications and video response questions as part of their interviewing process. If you’re new to this recruiting technique, the whole experience can seem a little intimidating. But don’t worry! If your first “take” doesn’t go well, you can always erase it and start again. And if you follow the following tips, they will help to ensure a 5-star application. 1. Plan before you record. Think about how you want to respond to the given prompt, and write out your answer ahead of time. Even though you shouldn’t actually read what you wrote while you’re recording, it will help you get your thoughts together and have a much more organized and precise response. 2. Don’t just repeat information from your resume. The recruiter has your resume in front of them so don’t repeat information that they’ve already read. Look for a way to share some additional info – for example, a specific situation where you used a particular skill or demonstrated a character trait or work ethic that makes you an excellent candidate for the job. 3. Make sure to create the right first impression. Look behind you to see what the recruiter will see when they watch your recording. Make sure that area is neat and clear of distractions. Eliminate any possible noise interruptions like dogs barking, children talking, etc. Choose a well-lit setting but not with light coming in directly behind you – that will create glare on the screen. Dress professionally at least from the waist up! While it’s not necessary to have on a suit for a video response question, you want to look professional in your attire. 4. Shoot several takes if necessary. Watch your recording. If you used run-on sentences, said “um” or “like”, had too many hand gestures or a weird look on your face, etc. do it again. Try to seem as natural and comfortable as possible while still coming across as a polished professional. 5. Let your personality shine! Video responses are a great way to set yourself apart by allowing the recruiter to see your personality. Your smile, demeanor, enthusiasm, etc. will attract the recruiter to you as a candidate and will help them remember you. Don’t be afraid to show excitement for this particular job opportunity. If you feel it is a perfect fit for you, tell the recruiter that. Recruiters love to make win-win matches where both the candidate and client are thrilled with the placement.